Business Intelligence is partly about analyzing a lot of data to see what happened, what is happening and what could happen, but it is also partly about how we interpret that analysis and then how we act on it. Organizations and people all over the world are using Business Intelligence in new, innovative and amazing ways to unlock insightful information. Current technology enables us to analyze, visualize and explore huge amounts of data but the real breakthrough in BI is the realization that we can now create true Business Intelligence applications for almost anything and everything. We are only limited by our imaginations which collectively can conjure up infinite possibilities. We are entering a time of limitless business intelligence. At InfoSol, we believe Limitless Business Intelligence is about seeing beyond the obvious and analyzing and using information in innovative ways to improve processes, people’s lives and make a positive difference in the world. We are passionate about implementing Limitless Business Intelligence solutions from helping reduce the time patients wait to see a doctor in hospital emergency rooms to improving manufacturing productivity without management intervention. Limitless BI is all about seeing beyond the obvious and using your imagination to create BI applications and solutions that make a real difference. More importantly, it is being achieved without business disruption and investing lots of money into alternative BI technology and tools. There is no shortage of examples. Here are a few links to help you explore. 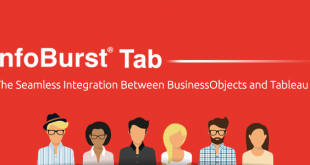 What can InfoBurst Tab do for you? Leverage the power of BusinessObjects and Tableau.